Microsoft is running a new promotion this holiday season to encourage gleeful shoppers to think "Windows Phone 7" while considering their next handset. The company will be issuing $25 gift cards which may be used on either Windows Phone 7 or Xbox Live app markets. This random act of generosity adds upon other promotions the company have recently offered to drum up interest. 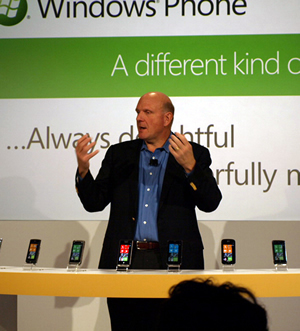 Last weekend, the offer was announced on the Windows Phone 7 blog. The deal comes at an auspicious time for Microsoft, paralleling recent news that the software giant's mobile operating system finally hit 40,000 titles in its app store, the WP7 Marketplace. That number is a paltry sum compared to the treasure trove of apps Apple and Google offer, but remains a respectable milestone for a yet still fledgling platform. At this time, iOS currently boasts 500,000 apps while Android closely follows with 400,000 titles. Nearly 11,000 apps were submitted to Microsoft's WP7 Marketplace in the past three months, 5,000 of which were added to the store this month alone. There appears to be more developer interest in Windows Phone 7 than ever, which may prove to be a good indicator of a healthy future for the mobile platform. It is interesting to note that Microsoft will be sending actual, physical gift cards through the mail and not electronic coupon codes as some may expect. To qualify for the gift card, customers must have purchased any Windows Phone handset between November 2 and December 31. The offer must be redeemed before Februrary 14, Valentine's Day. There is a five-per-household limit and the offer is only available in the United States and Puerto Rico. Microsoft's official terms and conditions can be found here.